Mr. Clarke joined the Federal Bureau of Investigation (FBI) in 1964, working in the Identification Division. He was appointed a Special Agent in 1967 and assigned to the Birmingham, Alabama Division. 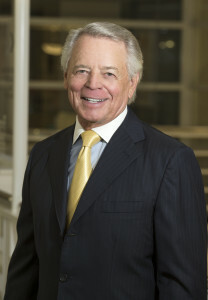 While at the Birmingham office, he worked on a variety of issues including white-collar crime and civil rights investigations. Throughout his career as a Special Agent, Mr. Clarke received numerous commendations for his work in bank, robbery, fugitive and organized crime investigations. In 1973, Mr. Clarke was transferred to the Identification Division as a Supervisory Special Agent and served in a number of different capacities, including supervising a special detail for former Attorney General Edward H. Levi. He was promoted to Assistant Special Agent in Charge of the Philadelphia Field Office in 1977, Inspector in 1979, and assigned as the Special Agent in Charge of the Kansas City Field Office in 1980. During his three decades of service in the FBI, Mr. Clarke had the opportunity to serve on numerous investigations of national merit. Some examples include, civil rights investigations in the South, including investigating the assassination of Dr. Martin Luther King, Jr.; organized crime investigations in New England; and extensive corruption and white-collar crime investigations. He was also the principal executive in the Nation’s effort to combat drug abuse when the FBI was designated to have concurrent jurisdiction with the Drug Enforcement Agency. Mr. Clarke was also one of the leaders of the successful investigation into the assassination of U.S. Federal Judge John H. Wood. During his career, Mr. Clarke was awarded the Attorney General’s Award for Exceptional Service, the Attorney General’s Distinguished Service Award and the Attorney General’s prestigious Edmund J. Randolph Award. The President also designated him as a Distinguished Executive in 1989 and a Meritorious Executive in 1990. Mr. Clarke is a graduate of The George Washington University.